Play Multi Dice™ online for free now! Are you the king of the dice? 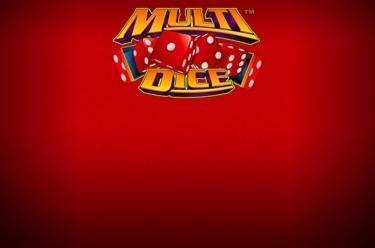 Try your luck at Multi Dice™! 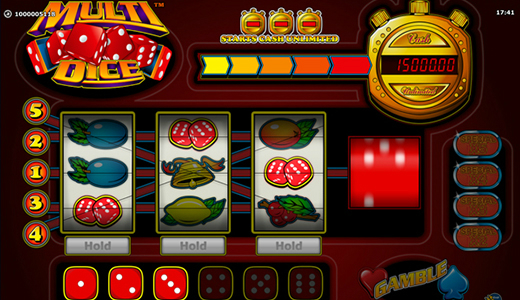 Here, a dice, 3 reels and lots of colourful fruits are on your side when it comes to raking in big winnings! Each triple combination on the 5 lines really gets the cash tills ringing! Look forward to increasing your Twist balance if you land ‘SPECIAL’ Multiplier on the dice in the bonus game and the stopwatch provides a fantastic random win! To win at Multi Dice™ you have to land 3 matching symbols along a win line. Are you one symbol away from a winning combination? Use the ‘Hold’ feature to fix reels in place for the next spin and increase your chances of winning! If you land multiple winning 3-symbol combinations on various win lines, all winnings will be added together. Land 3 Dice symbols anywhere on the reels to trigger the Dice Feature. Land 3 Dice symbols anywhere on the reels to trigger the Dice Feature. Click on ‘Stop’ to roll the dice. According to the number shown on the dice, you will be awarded with 1 to 6 Win Spins, all of which are completely stake free! From the launch of Dice Features, you have good chances that the lowest multiplier (SPECIAL X2) lights up. If this is the case, the following feature wins are doubled. Should you land 3 cubes on the reels in the current feature, you win more feature-rounds. Each time you win more rounds, the next higher multiplier lights up. The highest possible multiplier is x5. The stop watch to the top right of the screen will show a new win amount with every spin. If you land 3 stop watch symbols along a win line, you will win the Twist amount currently shown!